The box came in the usual sturdy and well wrapped format. The theme for the July's box is Around the World, which I didn't really featured beauty products originated from different parts of the world. Out of the items that I've received this month, I think nothing really stood out and attracted me. I thought that the Jimmy Choo fragrance is rather decent size while I couldn't care for the SKII & L'egere products as the former could be acquired easily through beauty counters and the latter just doesn't work for me. Amongst the 3 boxes (May, June, July) that I've received so far, I think June's box was definitely the best while the rest were not really eye catching (perhaps I have too high expectations?). Though I will still give it another go for one month, I think I might just unsubscribe to this service in the upcoming months. 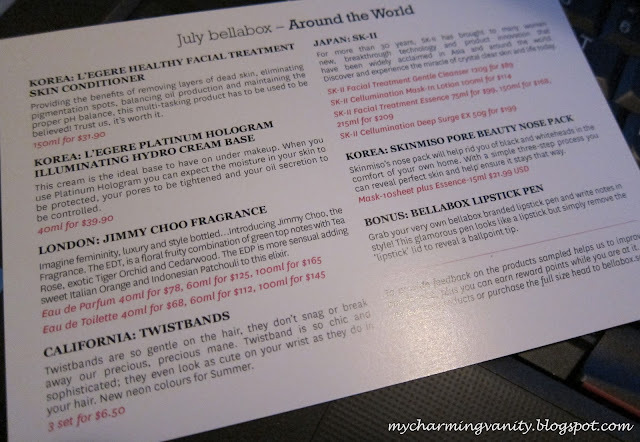 What are your thoughts on July's Bella Box?